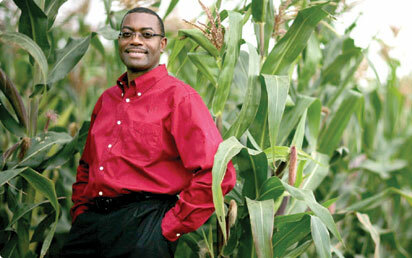 Adesina, who is warming up to assume office as the President of the African Development Bank next month, said it was unbecoming of Oshimhole to tag Jonathan’s Agricultural Transformation Agenda, ATA, as a dismal failure. Disagreeing with Oshimhole, Adesina insisted that the ATA was a real success story and not a sham as claimed by the governorIn a statement signed by his Special Assistant on Media, Dr. Olukayode Oyeleye, the former minister said it was most uncharitable for the governor who was in a better position to know the success of the ATA to attempt to discredit it for reasons best known to him. Governor Oshiomole ought to know better that, under ATA, efficient distribution of subsidised farm inputs – also known as the Growth Enhancement Support Scheme (GESS), reached 14.3million farmers with 1.3million MT of fertiliser, 102,703 metric tons of improved rice seeds, 67,991 metric tons of improved maize seeds, 6,171 metric tons of improved cotton seeds, 130 million stems of cassava, 45.5million seedlings of cocoa, nine million seedlings of oil palm amongst many other crops between 2012 and 2014. ” He is supposed to be expressing interest in the increased investment in the fertilizer sector totaling $5billion from major companies such as Indorama, Dangote, and Notore. ” He should have been asking his special assistants to study how usage also rose from 13kg per hectare in 2011 to 80kg in 2014, or how seed companies in Nigeria grew from 11, producing 14,000 metric tons of improved seeds, to 134 companies doing 174,000 metric tons of seeds. ” Furthermore, for the first time in Nigeria, rice cultivation is twice a year, in the wet and dry seasons. We have also seen the rise of thousands of small mills fitted with destoners and polishers producing parboiled rice of similar quality as imported rice. With the new investment in large scale rice mills, imported rice will soon become a thing of the past. ” In the Oil Palm value chain, a total of 9 million sprouted oil palm sprouted nuts were distributed to 45,353 small and large oil palm estate owners between 2013 and 2015. Additional Crude Palm Oil (CPO) production due to these interventions is projected to be 400,000 MT of crude oil palm which would close the gap of 350,000MT of crude oil palm that is currently being imported. There has been well over N100billion new investment in crude oil palm production in the country. ” If ATA is allowed to continue as conceived and implemented under Adesina, Nigeria could reach an additional 32 million farmers by 2019, up from 14.5million farmers reached with inputs between 2012 to 2014, reaching at least 8 million of unemployed youths. Should ATA continue, cassava processing capacity, currently just below 100,000MT/annum and a bane of the cassava industry, will be raised to 675,000MT per annum by 2019. Same thing with maize production, from the achievement of over 12 million MT/annum in 2014 (compared to 9million MT/year in 2011), we will increase this to 18 million MT/annum by 2019 to accommodate the rise in demand for food, poultry feed, and maize for the milling industry.